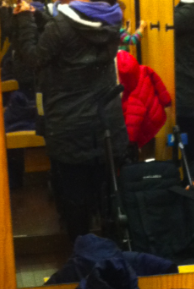 It took great strength today to walk away from the Apres Run Anorak but in the end I behaved. As you can see I’m wearing my new boots today and that was a good reminder for me why I can’t get this jacket this month. I tried on the size 10 and it fit TTS with a roomier fit in the chest and arms then lulu usually does, which is very nice for a change. I was wearing a bulkier fleece sweater underneath (the Apres Run Pullover) and was surprised I didn’t feel all bunched up and bulky. The length is perfect for my 5’4 short legged stature and my only issue was the fit was a bit boxy thru the torso…but then I noticed after taking it off that there is a cinch cord on the inside waist so you can take it in a bit for a narrower waist. I definitely prefer it cinched up at the waist. 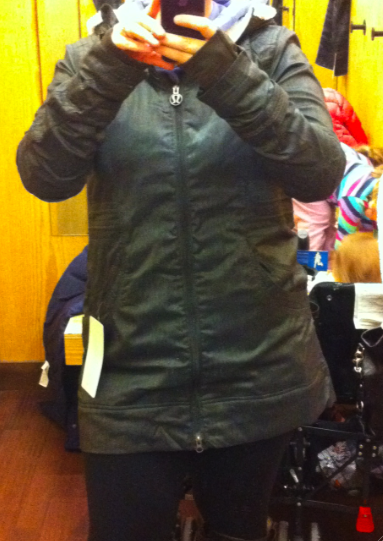 The material on the inside is Coolmax liner, just like in the Hustle Jacket which I love, and the outside is DWR Swift. 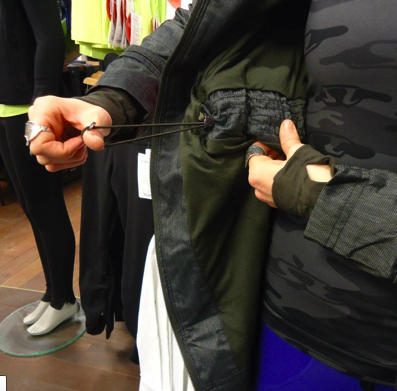 The combination of these two fabrics together makes for a stretchy, flexible and soft jacket unlike the Softshell rain jackets that lulu puts out that sometimes feels too restrictive for me to layer over sweaters. I love that they’ve basically made something like the Run Jackets and turned it into something for street wear/casual wear. 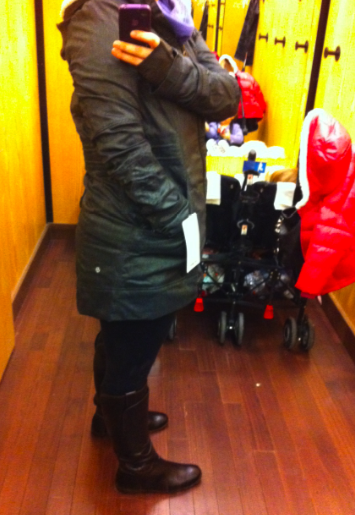 I found the jacket plenty roomy thru the hips with the perfect amount of flair for fuller hips. 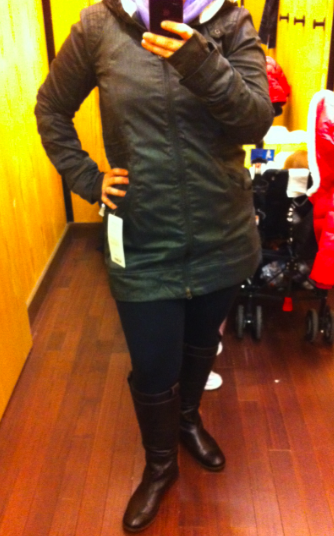 It really balances out the length of the jacket quite nicely for someone short like me. This jacket is on my want list for next month but still, I can’t really justify it so we’ll have to see. It’s priced reasonably at $158. **Reasonable considering the cost of other lululemon items such as Scubas, pullovers etc. 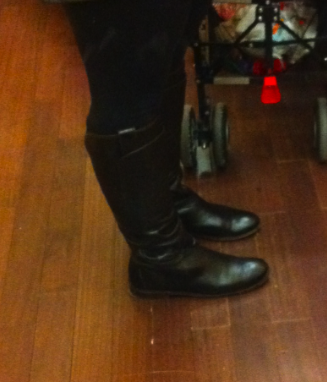 My new Frye Paige Tall Riding Boots. They are LOVE. Well worth the sacrifice of other purchases and I highly recommend them for larger calved girls like me. 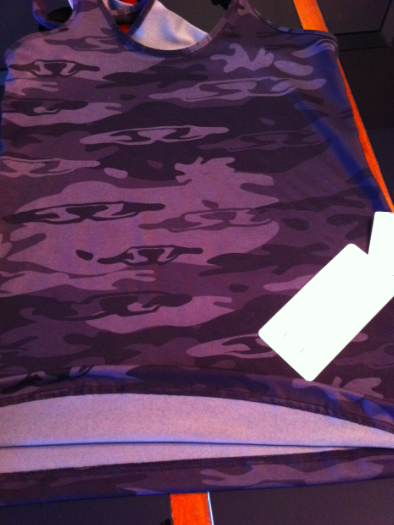 Ok, I was a little bad today in that I picked up this Retro Black Camo Print CRB. I’m a bit torn on it though because I really liked the look of the print/colors on me but it feels way cheaper then other CRB’s in both the polyester content (doesn’t feel as bad as some other printed CRB’s though, 94% polyester vs. some which have been 97%) and also the finishing at the bottom hem. The stitching seems a but uneven at the bottom on the inside and the fold isn’t pressed down so it doesn’t lay flat. I need to try it on again a few times to decide. Also, I paid $42 + tax for this tank and it is not reversible like the other CRB’s which are also priced at $42. I think this one should have been priced at $39. Another thing I noticed is that the price tag is $48 but it rung up at $42 so be aware that CRB’s will likely be going up in price in which case I will no longer be buying them.